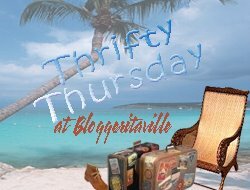 Time to show you my Thrifty Thursday purchases of late. I know I can be a greedy little pig when it comes to thrifty clothes and shoes and jewellery for myself. But just to prove that I can sometimes think of others, look what I bought for the office. 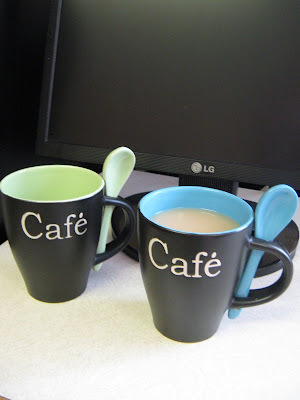 These 2 gorgeous mugs with their little attached spoons. Aren't they sweet; and for 50 cents each, I didn't have to go too far outside my budget. More money for clothes! Such as ..... .. 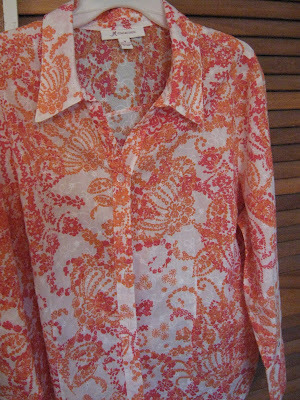 This beautiful blouse: It's not my size, but the colors and pattern and fabric are so gorgeous, I had to buy it. It will make a nice birthday gift in June for my girlfriend. .
Now this one is mine. 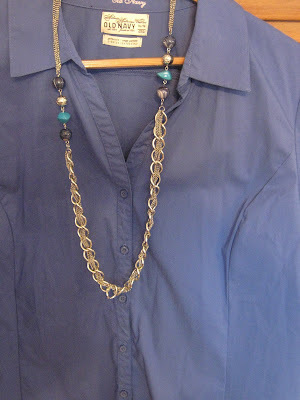 The necklace I thrifted last year; and it's a perfect match for this oh-so-soft jersey knit v-neck 3/4 sleeve shirt ($3.00 at The Daisy). 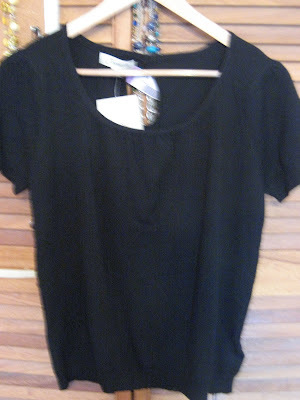 And this is mine as well: another very soft cotton shirt with just a little stretch in it ($3.85). 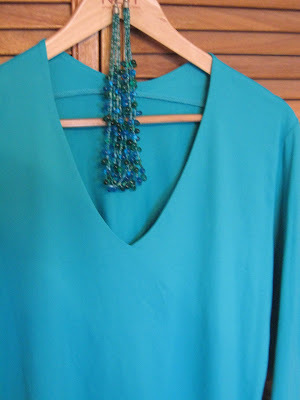 Although the color looks a little mauve here, it's actually a gorgeous periwinkle blue -- my favorite color. And I was very fortunately to find this brand new, still with the tags on, 20% cashmere black short-sleeved sweater ($3.00). .
Don't forget to go by and visit with Leigh of Bloggeritaville at Wednesday, April 06, 2011 for other thrifty purchases. She has some beauties today including a guestpost how-to for a barrel sunburst mirror. Don't forget my giveaway. Closes tomorrow at midnight, draw this weekend! I love the blue of the jersey knit! Looks like you had some good finds. I normally thrift for vintage goodies, but maybe I need to take a look at the clothes racks. Cute stuff! Brand spankin' new cashmere for three dollars??? Girl, I'm bowin' to ya right now!!! Ya did great on everything but my, oh my!!! I like those cups!!! great finds!